Ancient relaxation arts teach the interaction of body and mind through the ebb and flow of life forces. Practice of graceful and fluid motions centered on these life forces creates harmony of the body and spirit, control of stress and achivement of personal excellence. Motion devices can influence life forces in much the same way. Motion moves fluids through the body and brain. These fluids provide oxygen and nutrients which alter our perceptions and allow us to respond to stimuli in our environment. Combined with other technologies such as light, sound and vibration, motion can stimulate the brain and our “neural network” to assimilate information and recover from the effects of the stressful environment in which we live. Integrative Motion Systems creates motion devices that are tools for personal transformation, learning and self-healing. Tidal meditation through motion allows you to reach a relaxed, composed and focused state of being; to enjoy the calmness, serenity and effortlessness of your personal best. 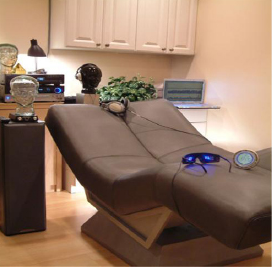 Experience relaxation as never before — through motion with the Symmetron/Neurowave.